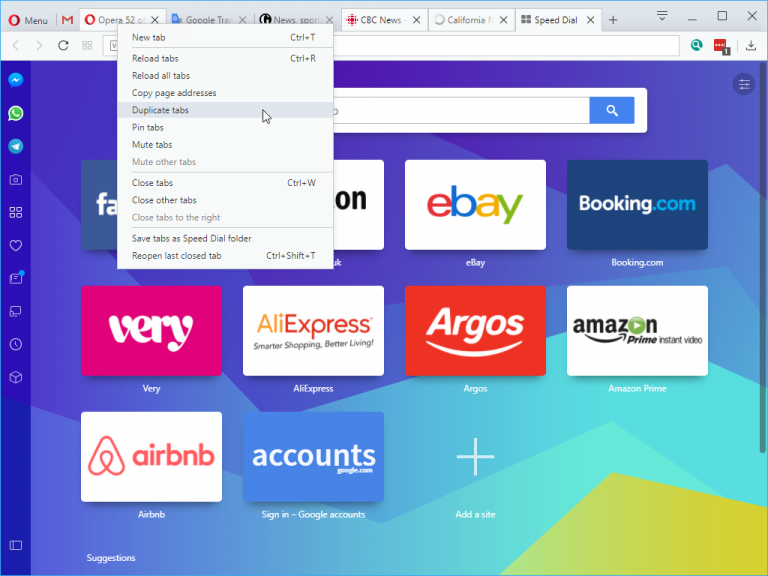 Opera Software has released Opera 52.0, the latest version of its Chromium-based browser for Windows, Mac and Linux. The main highlight in this new release is the unveiling of a faster ad-blocker tool. In addition, users gain the ability to select multiple tabs with a variety of related actions, including a brand new option for copying Web URLs. There are also new animations to accompany error and warning messages. Opera 52’s headline update is the improved ad-blocking tool. Now two years old and also offering protection against cryptojacking, the tool has been overhauled through improved string matching algorithms to increase performance and subsequent page loading times by around 16 percent over Opera 51. Entirely coincidentally, Opera claims its ad-blocking tool is also 44 percent faster than Chrome’s own recently unveiled offering. The new release also implements multiple tab selection -- users can now select individual tabs by holding Ctrl (or Command on macOS) and clicking each tab. To quickly select multiple adjoining tabs simply hold Shift and click on the left-most tab to select all other tabs to the right. The Shift key was previously used to close the selected tab -- users can now close a tab or group of tabs by holding Alt when clicking. Once selected, users can quickly reload, close, pin, mute or save the selected tabs to the Speed Dial. Users can also right-click the selection where they’ll discover a new option has been added to the context menu: 'Copy page address(es)', which copies the URLs to the clipboard for sharing. Opera 52’s final new feature is purely ascetic, as it replaces common error and warning messages with several space-themed animations. These cover DNS errors, internet disconnected, network accessed denied and site can’t be reached, plus warnings of malware and fraud. For a full list of other minor changes, improvements and bug fixes, check out the Opera 52 changelog. Opera 52.0 is available now as a freeware download for Windows, Mac and 64-bit Linux users. Existing users can update from within Opera itself -- simply open the Opera menu and choose About Opera to do so.